Organisations use development methods when developing a product or a service, to help them deliver the product/service efficiently and also to help them keep cost of production to a minimum. There are quite a few development methods depending on what the project is, these methods are available for companies to use to increase their productivity. 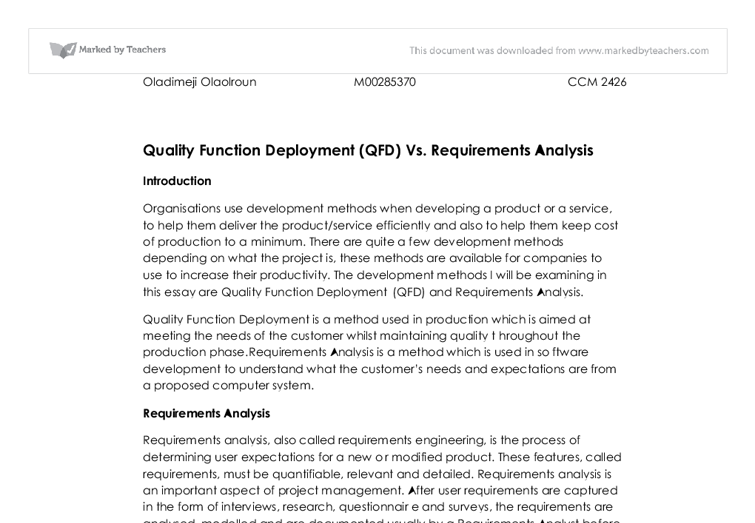 The development methods I will be examining in this essay are Quality Function Deployment (QFD) and Requirements Analysis. Quality Function Deployment is a method used in production which is aimed at meeting the needs of the customer whilst maintaining quality throughout the production phase.Requirements Analysis is a method which is used in software development to understand what the customer’s needs and expectations are from a proposed computer system. Requirements analysis, also called requirements engineering, is the process of determining user expectations for a new or modified product. These features, called requirements, must be quantifiable, relevant and detailed. Requirements analysis is an important aspect of project management. After user requirements are captured in the form of interviews, research, questionnaire and surveys, the requirements are analysed, modelled and are documented usually by a Requirements Analyst before the stage of designing the proposed computer system begins. The House of Quality is the most popular form of QFD and is used by a multidisciplinary team to interpret the customer requirements into a product that matches stated requirements at the same time as bearing in mind the engineering objectives and competition in the market for a similar product. Customer Requirements is well organised lists of requirement information gathered from customer or the end user this statement is also known as “Voice of Customer” (V.O.C). The company develops a focal point on what the customer wants rather than what they want to develop. Technical Requirements is an organised set of relevant and measurable design characteristics of the product that is being developed to respond to customer requirements. Characteristics would be presented in an order. Interrelationship Matrix the interrelationship matrix is used to calculate the relationship between the customer requirements and the engineering characteristics of the product. The correlation is measure by either symbols or numbers that show not only the relationship but also how strong the correlation is. Planning Matrix the planning matrix allows a development team to compare their product against a competitor’s product and see how well it does. They will also develop a technical evaluation of prior generation products and competitive products. QFD uses the “House of Quality” model to exemplify data and ideas collected from the users/customer Requirements Analysis uses models such as Use Cases to do the same thing. Both methods, first stage is to search for the understanding of what the customer requirements are first instead of designing the product/service first. In my opinion both Quality Function Deployment and Requirements Analysis are good methods used in project management. 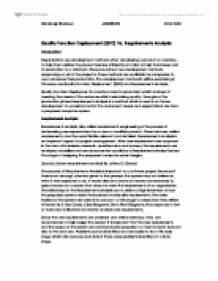 Despite the fact that they’re used in different company environments, both Quality Function Deployment and Requirements Analysis have similar characteristic that are used frequently in both methods, some similar characteristics they both have even sometimes perform the same functions such as establishing what the use requirements are. Both methods ensure that the final product / service meet the requirements of its intended user / customer. They are both designed to reduce labour hours to construct a product/service, costs and to guarantee a good quality outcome product to the user requirements specified . Simon Bennet et al. (March 2010), Requirements Analysis. Object-Orientated Systems Analysus and Design (4th Edition). Pp 180 -184. As the prototype is being developed it will become clear what the schedule is for the final version. Therefore it is at this stage that a implementation plan is created and agreed upon. 3.4.2 Design and Build Iteration The product is designed, developed and reviewed. Cisco has served as a pioneer, a prototype that many companies have followed and based their IT strategy on. Industry companies have implemented information technologies in their core business that will ultimately benefit their customers. Value is passed to customers when each process is automated with information technologies. As the potential carrier of a smart 'ID' card, which the government wishes to introduce in the near future, it brings to mind questions such as, "Will I want one? ", "Will I have to have one? ", "What will it do for me? ", "Will it be safe for me to hold one?". switch for this network, as it maximizes productivity and investment protection by enabling a unified network for data, voice, and video. The topology that will be used for the network is a star and extended star. It is considered reliable because if one connection fails, it doesn't affect others. Also the owners need to demonstrate the new plan for the business and why to input new system into the hotel, and how the new system will helping the hotel to growth, and we will provide the detail on the advantage of using new technology of the new system. In addition the group assumed that as the database (phpmyadmin) will work with a 99.9% uptime, this was vital if it failed them the system would not work and transactions will not be processed. The group backed up the database so it could be restored if any corruption of data occurred. When developing a system it needs framework and methodology to guide and control the information system development. The system methodologies can be separated into hard and soft systems, a hard system is usually used in department that collect large amounts of data, also the department is very data intensive an requires a lot of control and organisation.